The Chittorgarh fort, popularly known as Chittor, was the capital of Mewar and is today situated in Chittorgarh, Rajasthan. The formidable fort is perched atop a 180 meter high hillock near the Gambheri River and it covers an area of 700 acres, extending to 3 kms in length and 13 kms in peripheral length. The fort is studded with a series of historical palaces, gates, temples and two prominent commemoration towers. It is a symbol of heroism and sacrifice that is engraved in its history. Chittorgarh fort continues to be a living fort with many villages inside it still calling it home. The roots of this mighty fort go back to 7th CE when the Mauryan King Chitrangada Mori built it, and the fort derives its name from his name, as inscribed on coins of the period. By 8th CE it passed on to the Sisodias of Mewar. Historical records show Chittorgarh fort as the capital of Mewar for 834 years till they were forced to establish their new capital at Udaipur. The fort was looted and destroyed at the hands of Emperor Akbar in 1568 AD. But in 1616, Jehangir returned Chittor fort to the Rajputs, when Maharana Amar Singh was the chief of Mewar. However, the fort was not resettled though it was refurbished several centuries later in 1905 during British Raj. The Chittorgarh served as the capital of the kingdom of Mewar in Rajasthan. The Indian state of Rajasthan has traditionally been home to dozens of warrior clans and princely states, of which, Mewar was among the mightiest. 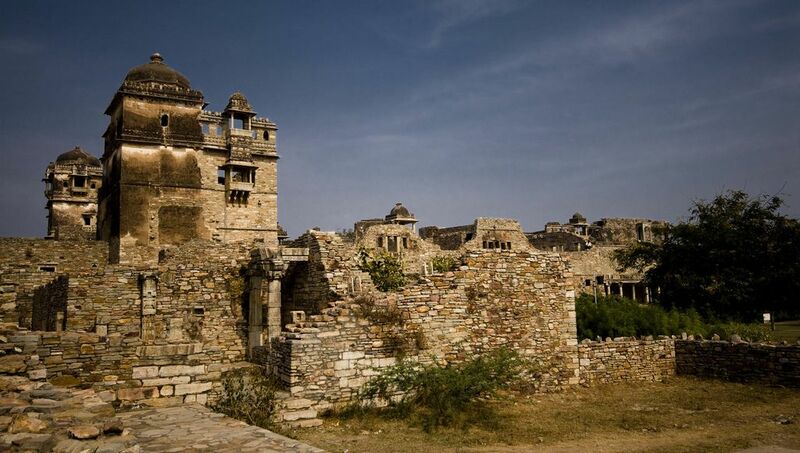 Chittaurgarh Fort is truly an embodiment of chivalry and pride of the Rajputs. A glimpse of the fort still makes one to think the glory of the Rajputs who once lived here. Chittorgarh is home to one of Rajasthan’s most popular folk heroes, Maharana Pratap. Chittaur evokes memories of great heroism and sacrifice by Rajput men and women in the intermittent battles that they had to fight against invaders from Northwest or Delhi. The fort was attacked three times and Each time the men fought bravely rushing out of the fort walls charging the enemy but lost every time. Chittorgarh fort is also called as Water Fort. The fort had 84 water bodies, out of which only about 22 exist today. These Include talabs (ponds), kunds (wells), and baories (stepwells). All the talabs have a natural catchment. The kunds and baories are located below the talabs, so that even the seepage from the latter is not lost. Within the fort complex, you’ll find 65 historic structures. This includes 4 palaces, 19 temples, and nearly 20 ponds and wells. It also includes two famous stone towers – Vijay Stambha and Kirti Stambha. This colossal fort is accessible through seven huge gates (Pols) that are comprised of strong iron spikes and served as a watch tower in earlier times. All the gateways to the fort have been built as massive stone structures with secure fortifications for military defense. Within the fort, a circular road provides access to all the gates and monuments located within the fort walls. This is the core of Chittorgarh fort – the main palace area where the royal families lived. The ruins of this palace are the oldest construction within the fort complex, named in honor of a 15th century king, Rana Kumbha who defeated Mahmud Shah Khalji. The palace included elephant and horse stables and a temple to Lord Shiva. Maharana Udai Singh, the founder of Udaipur, was born here. The palace is built with plastered stone. It is believed to have underground cellars where Rani Padmini and other women committed Jauhar. It is a mind blowing 9-storey tower that is adorned with sculptures of Hindu deities. It was built in 1440 AD by Maharana Kumbha to commemorate his victory over Mohamed Khilji. In order to get on top, one has to climb 157 narrow steps to gain a panoramic view of the whole town. When illuminated in the evening, the tower reflects a mesmerizing effect and the view is worth capturing in the camera. Constructed in the 12th century, Kirti Tower is a 22 m high structure with 54 stairs. It was built by a Bagherwal Jain merchant Jijaji Rathod in honor of Lord Sri Adinath Rishaba who was the first Jain Tirthankar (revered Jain teacher). An imperial statue of him is constructed in front of this tower. The tower is popular for its grand architecture that is indeed worth admiration. It is a deep tank filled by a spring that resembles the mouth of a cow and considered to be sacred. 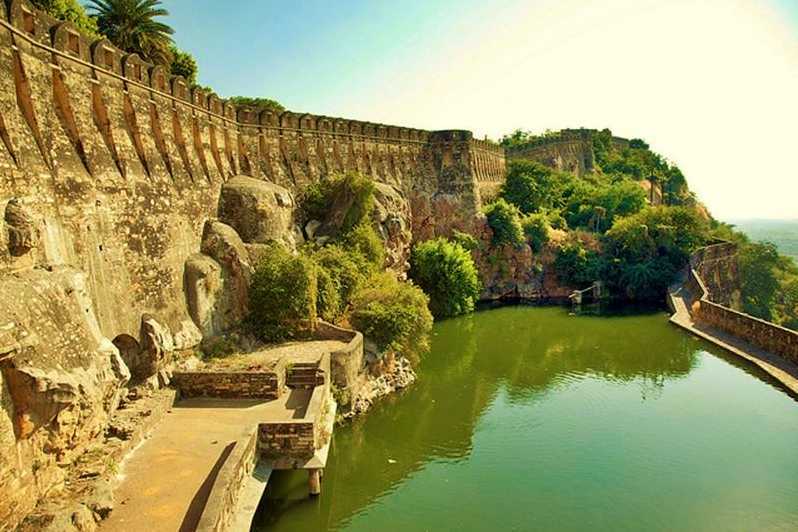 Situated at the edge of the cliff, near Samadhishwar Temple, this reservoir is one of the most important water tanks of Chittorgarh Fort. A palace built in a small man-made lake to honor the memory of Rani Padmini, who was said to be a legendary beauty. As per legend, the Sultan of Delhi, Alauddin Khilji became besotted with the Rani after glimpsing her reflection in the lake surrounding the palace. He sacked Chittor to win her affections, but Queen Padmini and the women of the court sacrificed themselves in a pyre of fire rather than submit to anybody. This supreme sacrifice has been called ‘Jauhar’ and epitomises the fiery spirit of the Rajputs of the day. It is associated with the mystic saint-poet Meera Bai who was an ardent devotee of Lord Krishna and dedicated her entire life to His worship. The popular legend associated with her is that with blessings of Krishna, she survived after consuming poison sent to her by her evil brother-in-law. Rana Khumba built it in an ornate Indo–Aryan architectural style. The pinnacle of the temple is in pyramid shape. Originally, a Sun temple dated to the 8th century dedicated to Surya -the Sun God, was destroyed in the 14th century. It was rebuilt as a Kali temple. Fateh Prakash Palace is the youngest palace of Chittorgarh fort built just about 100 years ago. Build by Maharana Fateh Singh this huge palace is of morden style. This palace, now a museum, has a rich collection of sculptures from temples and buildings in the Fort. The hill fort also contains 6 Jain temples. The largest and chief among them is the temple of Bhagawan Adinatha with fifty-two Devkulikas. There are ruins of Nagina Bazar and Moti Bazar on the road going towards Ratan Singh Palace from Kumbha’s Palace. The ruins extended along the both sides of the road. It served as the local market for the residents of the fort, but now only ruins are visible on both sides.